A remake of Daniel Tinayre’s La Patota (1960), Paulina is a complex exploration of the ethics of political action and a provocative character study of a social justice activist – and her unsettling choices in the face of violence and social discrimination. Set in a racially and politically marginalized community in Argentina’s Northeast, the film tackles the moral ambiguities of those who seek to aid and ally themselves with the disadvantaged from their positions of privilege. 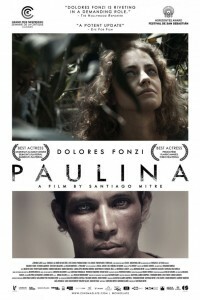 When the film begins, Paulina (Dolores Fonzi) leaves a promising legal career in the shadow of her politically-powerful father to work as a school-teacher in a rural village, on the border with Paraguay and Brazil. Paulina speaks no Guaraní and her teenage students artfully parry her attempts to lift them into political consciousness. These uneasy encounters, and subtly observed civics lessons, echo disturbingly in the aftermath of a violent sexual assault by a group of young men. Paulina’s decisions in its wake, portrayed without judgment by Fonzi, mercilessly test her relationships and core beliefs.